At 3:46 am this morning Clackamas Fire District 1 responded to a residential fire in the 9000 block of Top O ‘Scott St., Happy Valley. Upon arrival, crews were met by two people who had gotten out of the home and reported there was still a female inside of the home on the second floor. Heavy fire and smoke engulfed the front door, so firefighters made access through the back patio door. Inside they found extreme fire and smoke conditions on the first and second floors, and were able to find the stairs leading to the upstairs bedrooms. Two firefighters quickly made their way up the stairs and the remaining two firefighters attempted to assist, but were forced back outside from fire. The two firefighters who made their way upstairs, checked the rooms, and located the trapped occupant in one of the bedrooms. Firefighters later reported that the carpet was melting under their boots in the hallway, as they entered the room and shut the door behind them. The two firefighters located the bedroom window and radioed that the victim was located, would not be able to exit the structure from the way they entered, and would have to exit out the second story window. Firefighters broke out the window and one firefighter used their bail out system that they were wearing. 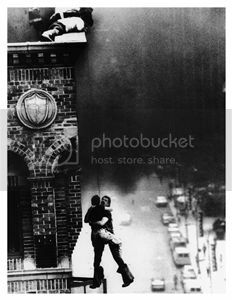 The bail out system allowed the firefighter to hang from a rope, as the other firefighter led the occupant to the window and assisted her onto the firefighter that was hanging from his rope. The second firefighter also bailed out and as he did, the bedroom had become engulfed in fire. They came to rest just below the second story window with them holding the occupant, as another crew raised a ladder to assist in the rescue. The occupant was assisted onto the ladder, where another firefighter helped her down. The patient was alert, able to walk to the stretcher, and was transported to the hospital. The patient’s condition is unknown at this time. Additional engine companies continued to suppress the fire and within 30 minutes, the fire was under control. Fire investigators were on scene to determine a cause and no firefighter injuries were reported. Crews worked quickly and efficiently to produce a positive outcome in this fire. The homeowner said that she woke up to the sound of the smoke alarm and was able to escape the home. The homeowner’s five family cats were found deceased inside the home and there was extensive fire and smoke damage that occurred to the home. Portland Fire and Rescue assisted Clackamas Fire along with AMR. This is a case of smoke alarms saving lives, along with the quick thinking and highly-trained firefighters risking danger to save a life. The setup below will allow for: Belaying Victims, Bailing and Rappelling with victims (as was the case yesterday) or for Firefighter Bailout. 1st Pic: Colorado Belt that is through bunker bottom belt loops, with the leg strap already wrapped around the right leg to make this a class II harness. 2nd Pic: Turnout bunkers Right pocket is split 70front/30rear. The front is for 50’ of rope and our descender. the 30% is for hook storage. Red pull tab for quick deployment with structural gloves on. 4th Pic: Talon hook (replaceable tip) with a Sterling FCX descender. All of our bailout equipment is stored the same across the district and pre-rigged for minimal effort and time for deployment.